Josh Beckett took the mound for the Dodgers today and started a rather predictable road back to down to ‘quality starter’ from ‘invincible demi-god’. Entering the game with a stellar 2.11 ERA, Beckett surrendered five runs on six hits and a walk in five innings of work, raising his ERA to 2.46 on the season. Something like this was bound to happen at some point down the road, as one of his 3.77 FIP or 3.41 SIERA was going to catch up. Simply put, a .231 BABIP against and 88% strand rate for him wasn’t sustainable. Of course, the loss isn’t all on Beckett, as the Dodgers had multiple opportunities to put up a crooked number and found creative ways to avoid it. Carlos Triunfel started the festivities by striking out in the first with the bases loaded. In the very next inning, Yasiel Puig and Matt Kemp whiffed with the bases loaded before Andre Ethier grounded out weakly to first. And somehow it got worse. In a bizarre play that included a double challenge, Adrian Gonzalez flew out to left into a triple play with Dee Gordon caught at home trying to score and then Puig being thrown out at second trying to catch the catcher by surprise. They did it again in the fifth, loading the bases with nobody out before Drew Butera, Hanley Ramirez, and Clint Robinson all whiffed. 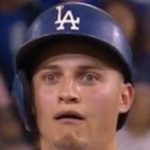 All told, the Dodgers left a combined 25 men on base. And that was the story of the game. -Dee Gordon had a hell of a June to bounceback after struggles in May, and he continued his hot hitting with a 3-for-4 effort today. However, his efficiency on the bases has taken a tumble, as he’s six for his last 12 in stolen base attempts. -The Dodgers failed to win four in a row for the seventh consecutive attempt on the year. Next What If An Ump Taught Yasiel Puig How To Bat Flip?